Serving the communities of Acosta (15520), Berlin (15530), Boswell (15531), Cairnbrook (15924), Central City (15926), Fairhope (15538), Friedens (15541), Garrett (15542), Glencoe (15543), Gray (15544), Hidden Valley (15502), Jenners (15546), Jennerstown (15547), Jerome (15937), Kantner (15548), Listie (15549), Markleton (15551), New Baltimore (15553), Que Creek (15555), Rockwood (15557), Shanksville (15560), Sipesville (15561), Somerset (15501), Stoystown (15563). Experience 110 acres of fields, rivers, woods, and a state-of-the-art facility just one hour north of Pittsburgh. Certified by the American Camping Association, the curriculum at Camp Allegheny is focused on Christian Principles and promotes an awareness of God in nature and a relationship with Him. Minimal cost for qualifying families. Contact the office for more information. We are seeking members in the community who would like to volunteer in our Emergency Disaster Services (EDS) unit in Somerset County. EDS is a division of The Salvation Army that provides services to support the basic needs of those who are affected by local disasters. Our volunteers try to meet the basic needs of survivors and first responders in the field by providing food and hydration from our mobile feeding trucks. Volunteer once a week, once a month or whenever best fits your schedule. Times are flexible! Ladies Luncheon – Saturday, May 11th, 2019 at Somerset Alliance Church – Vendors and silent auction. 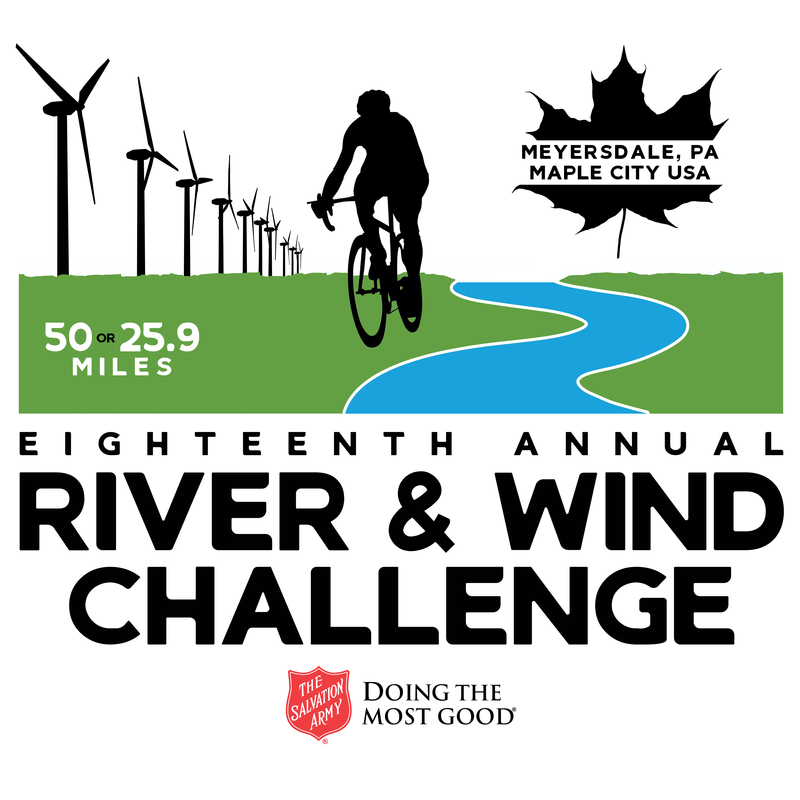 River and Wind Challenge – June 1st 2019 – New course for 2019 highlighting Historical Somerset County. Harvest 5K – Run or Walk in your favorite harvest attire! Prizes will be awarded for top finishers and costumes. Fun for the whole family! Come join us on Saturday, June 1st for our new and exciting routes for 2019! Somerset County is rich in history, and this ride will take you through time! The 50 mile or ½ century ride will start and end in Meyersdale “Maple City USA.” Along the route, you will venture through viaducts, a tunnel, and the Mason Dixon Line. You will experience breathtaking views, windmills, 100 year old Maple trees, and small towns. The 25.9 mile ride will also start and finish in Meyersdale “Maple City USA.” You will travel to the Mason Dixon Line, riding through the tunnel, and experience some of the best views in Western Pennsylvania! Most of all, you are riding for a great cause!